Congrats to the U16s who completed the North Munster League and Cup double. 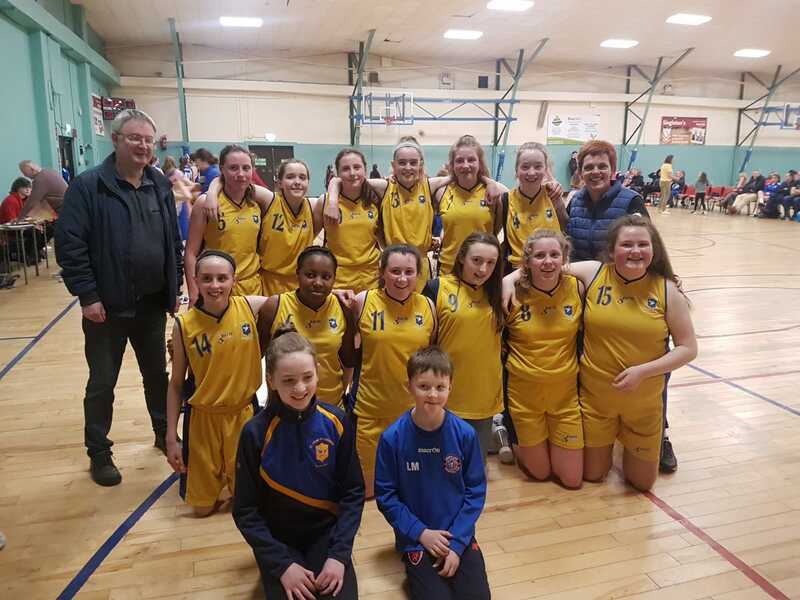 The Parochial Hall in Cork was certainly the place to be as our U14 girls and Bantry served up a belter of a game to determine who would win the U14B league. Both sides came into the final game of the season with one defeat each in their league campaign. Bantry had won the reverse fixture by 13 points early in the season and were warm favourites to win out again.Our girls went into the game minus the injured duo of Amy Buckley and Melissa Do, so the odds were stacked against them.The game appeared to be following pre match predictions as Bantry opened up a 15-6 first quarter lead and extending it slightly out to 25-15 at the interval. Bantry increased their lead to 12 points mid way through the third quarter, before a late rally by our girls reduced the deficit to 33-26 going into the final quarter. A switch in defence early in the third quarter began to show early signs that the girls were still very much in this game. U12 player Grace Liston was a revelation as she completely shut down Bantry's main scoring threat and focal point. Bantry really struggled for scores in the final quarter and gradually our girls clawed their way back to tie the game 37-37 at the end of normal time.One period of overtime could still not separate the sides. In the second period of overtime, our girls took the lead for the first time in the game. Bantry could not rally and our girls closed out on the win on a 44-39 side. Bantry should be commended for a superb match. The win was just reward for a great bunch of girls who have showed tremendous improvement over a long season. 18 girls contributed in some way over the season and this was a true squad effort. On the night Nofeesat Muniru 15 and Alana Moran 14 top scored for the girls. Our U16 girls on any other week would have received top billing. 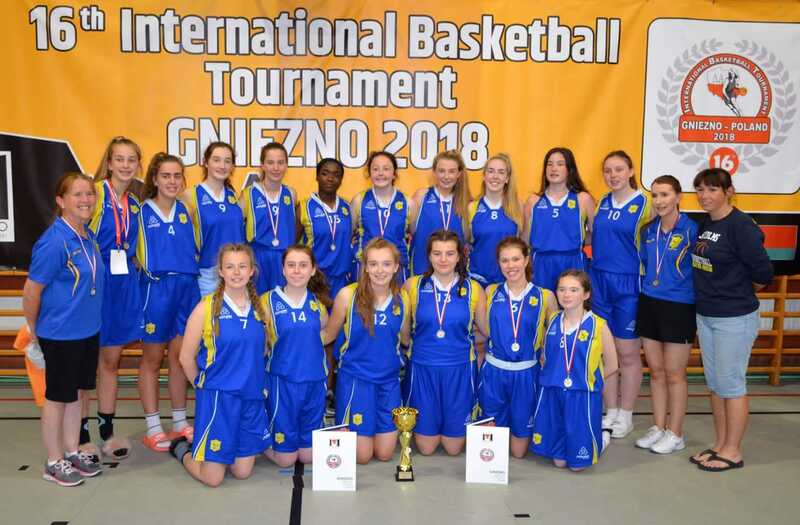 However it is a measure of their consistency of high level performances that we expect these girls to win every week.The girls added the North Munster U16 league title to their North Munster U16 Cup win with a hard fought win over Limerick Celtics. The girls had one of those nights where nothing fell their way. Basket after basket was missed as nerves seemed to play their part. However an exceptional defensive performance by the girls in the third quarter restricted Celtics to only two points. This was the platform for the girls to seal the win on a score line of 41-34.Top scorers were Sophie Moore 21 and Bronagh Dollard 8. 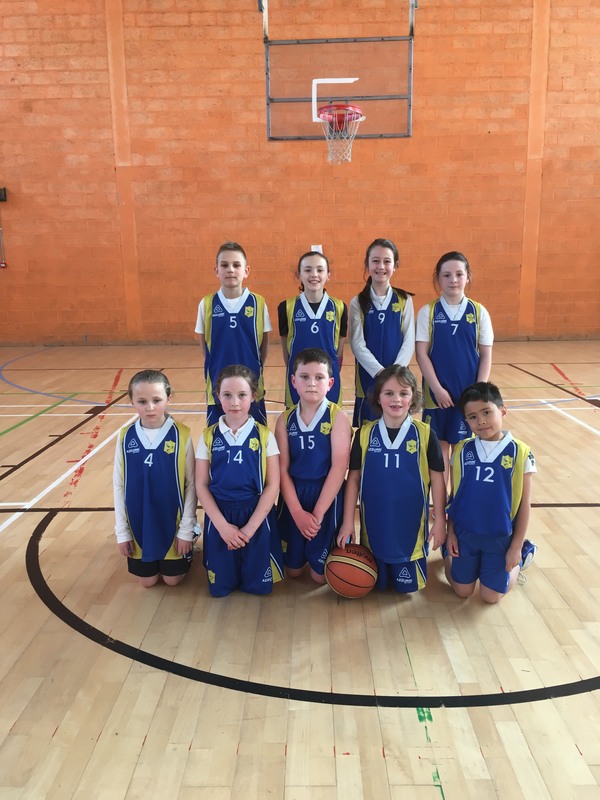 Our girls had earlier in the week played Skiibbereen in the Cork League and came away with a very comfortable 62-26 win with Meabh Brown top scoring for the girls. The girls travel to Gormanston to compete in the AICCs and we wish them the best of luck. 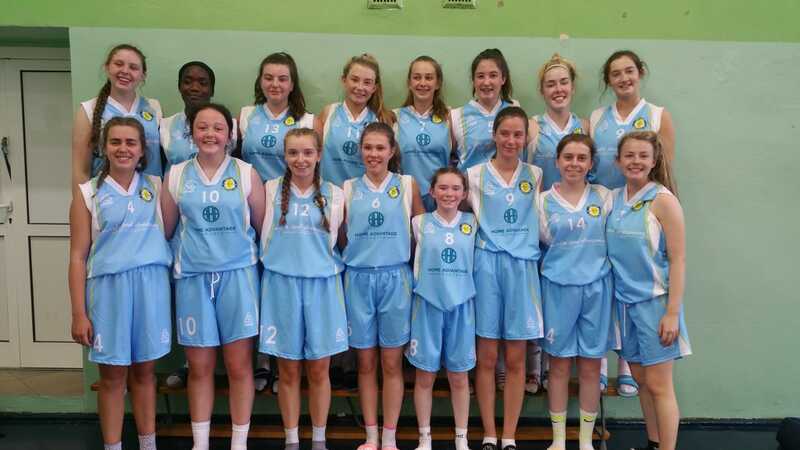 Our U18 girls finished their Cork League campaign with a loss. The girls went into the game minus Sophie and Bronagh who were away on international duty. The girls edged a close first quarter to lead 14-12 and stretched their lead out to 12 going into the final minute of the second quarter. A complete loss of focus by our girls allowed Carraig na BhFear score 6 unanswered points. The away side had momentum on their side and completely took over in the second half to win out deserving winners 58-48. Best for St Colms were Jody O' Halloran 14, Amy Higgins 14 and Evelyne Mancassola 7. Finally it was a big week for our U10s. 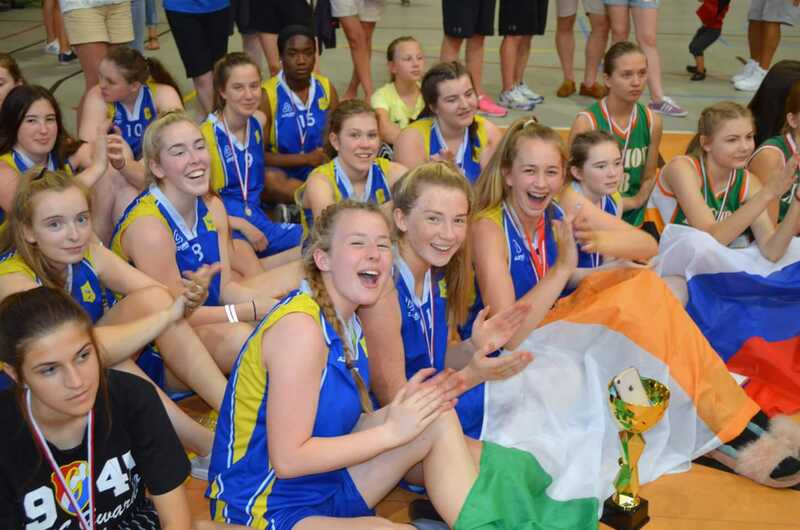 The girls played Limerick Celtics last Wednesday in a very competitive game. It was great to have all 12 girls available for the match. Great skills and real improvement was shown by all girls. We have a very young squad with 6 girls being under 9. Well done to everyone. 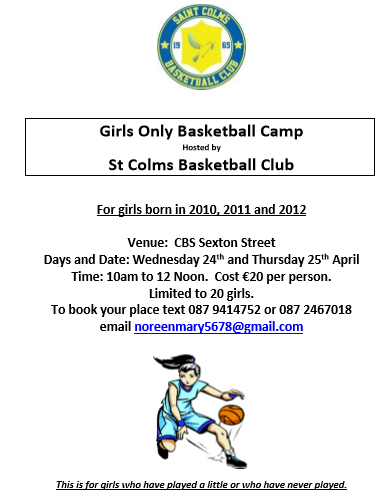 The squad is Kate C, Kate O'B, Kayla, Eabha, Laura, Roisin, Cliodhna, Blaithin, Robyn, Tiegan, Samantha and Niamh. Our under 10's then travelled to Newport on Sunday. Unfortunately we didn't have all the girls, so the boys stepped up. Again a great display of basketball from both sides was evident. Well done to all the players. The squad was Kayla, Laura, Cliodhan, Blaithin, Robyn, Niamh, Jacob, Armandus and Shane. Thanks to all the parents for their support. Next week will also be busy for the 10s. We will host Castleconnell Warriors next Wednesday 10th and we will make the journey to Morning Star in Hospital on Friday the 12th.